Of all the sights and experiences for this trip, I was most looking forward to today. It was an early rising day, up at 6, breakfast on the ship, and the busses departed at 8. 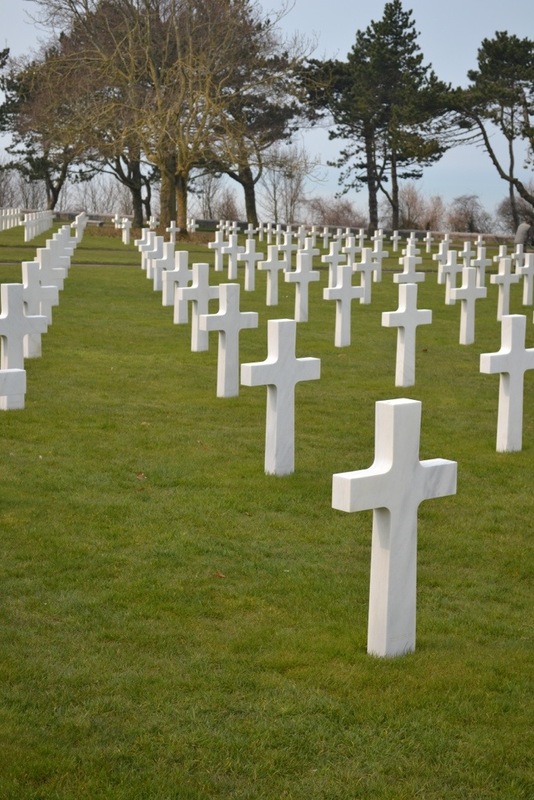 We had a 2 hour ride to the beaches of Normandy. It began to rain as we approached the coast, and then turn into a wet snow. It wasn’t very pleasant out, and I really hoped it would clear up by the time we got to the cemetery. Our first stop was the Musee de Debarquement. We learned of the complete port built in England and floated to France, allowing for supplies to be provided to the troops coming on shore. Fascinating. The whole tour had lunch at Brasserie Left 6 Juin down the street from the museum. Decent meal given the out of the way location. 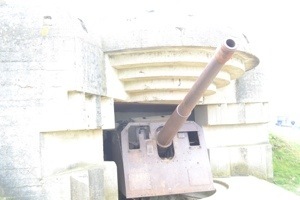 I really liked the Batterie De Longues Sur Mer. I messed up my camera settings there so this came out overexposed, otherwise look at their website. The German guns in concrete, impenetrable bunkers were sobering. 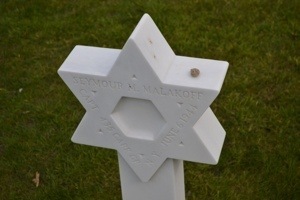 Next was the Normandy American Cemetery and Museum. 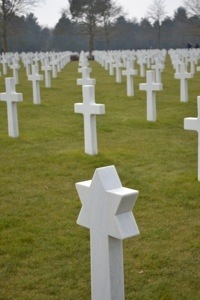 As many pictures as you’ve seen of the rows of crosses, it is still a stunning sight. Our tour guide made a little speech when we got there, we had a moment of silence and then sang the National Anthem. So moving. I was taken by the Jewish stars that appeared here and there. I left a stone on a couple of them. Our last stop was down on the Omaha Beach. 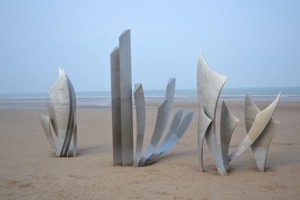 The memorial for the 60th anniversary of D-Day was an interesting metal sculpture, so different from the usual marble. Then it was time for the 2 hour trip to return to Rouen. We had of course booked dinner in town, at what may be the oldest restaurant in France, where Julia Child developed her love of French cooking. If you have been in business since 1345, you must be doing something right. The restaurant was La Couonne. We had the prix fix meal for only €35. I had an appetizer of tuna in lemon sauce, Ellen had duck pâté. We both had duck in a berry sauce with cabbage and asparagus. When i commented to Ellen that she was having a lot of duck, she responded: “That’s one tasty little quacker!” Ellen loved the cheese course that followed. And Ellen had a chocolate dessert, I had ice cream with fresh fruit. The dining room we ate in was wood timbered, dark and red with wooden ceiling beams. The waiters were formal and an older woman who was host for the night walked among the tables, talking with everyone. She spoke English with us, asking where we were from and how we enjoyed the meal. It was an experience of a meal, French fancy as opposed to French simple at the bistro yesterday. 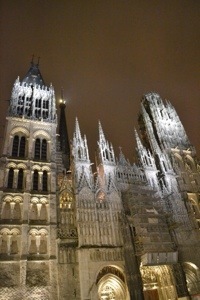 But we definitely like Rouen and could have found more restaurants to dine at. Tomorrow is mostly sailing, with a visit to one small town along the way. To our horrors, we learned we will have to eat all 3 meals on the ship tomorrow! It should be fine as we start our return to Parris. Pictures are going to be smaller today, our satellite Internet on the ship is not cooperating. Today was an easier day, as we sailed in the morning. A lecture at 10am delivered the story of Joan of Arc, essential for visiting Rouen. We were the first off the ship again, right at 1pm when we arrived in town. Up the hill to the TI office, which was right across the street from the Cathedrale Notre-Dame. Monet stayed in the building right across the street and painted the church over 30 times. Ellen had Rick Steves’ walking tour on her kindle, so that guided us around the town. The church had been heavily damaged in World War II, you can still see the patchwork in the ceiling where the spire crashed though after the bombings. The streets had the half timber buildings we had seen in Vernon, but more of them, whole blocks long. 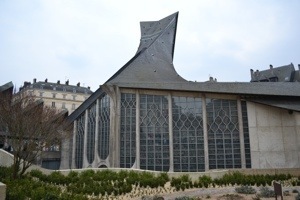 The Church of Joan of Arc is quite modern, built in 1997 on the site of her burning. The shape of the roof is meant to evoke the flames. 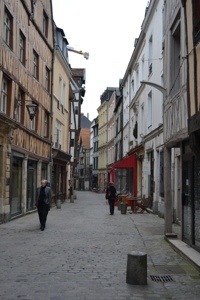 Walking the streets of Rouen was wonderful, it is large enough to have 2 department stores and lots of shops. There were a large number of chocolate shops, each with tons of nicely decorated, handmade Easter candy. 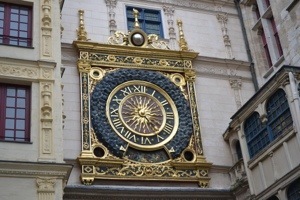 We stopped to get out of the cold and had afternoon tea/coffee before seeing the grand clock, Gros Horologe. We walked back to the ship for a brief visit and to hear the plans for tomorrow’s visit to Normandy. Then we were back out to town. Ellen found a great bistro, Gill Cote Bistro, the informal cousin to a more fancy and expensive restaurant. We arrived for dinner at 7:30pm and were the only ones in the place. Everyone else who came later was French, we took that as a good sign. We had wine, veal for Ellen and chicken for David, and shared a huge dessert, thick dark chocolate with hazel nuts on the button, light chocolate mousse on the top. Yum! We walked back to the ship, uploaded our pictures to our iPads, and are turning in early with an early 2 hour bus ride to the beaches tomorrow. 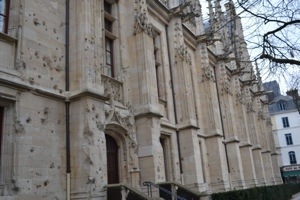 I’ll end with a picture of the Palais de Justice, whose outer walls still bear the marks of the Normandy invasion.